There are so many reboots and revivals in Hollywood these days, it’s enough to drive you crazy, if you let it. But surely you can make room in your hearts for an updated 9 to 5. 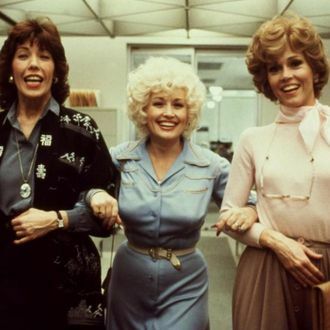 According to Deadline, the original movie’s writer, Patricia Resnick, is working on the project for 20th Century Fox, and is trying to bring in Rashida Jones to co-write the story in a way that’s relevant to “a young comedy audience.” (Vulture politely suggests bringing back Dolly Parton, Lily Tomlin, and Jane Fonda regardless of the punched-up premise, as they appeal to an eternal comedy audience.) And why, you ask, would a studio want to make a movie right now about a trio of career women who plot a takedown of their chauvinistic, lying, sexually predatory boss who overlooks them for promotions and passes their good ideas off as the property of lesser men? Oh, no reason. No reason at all.